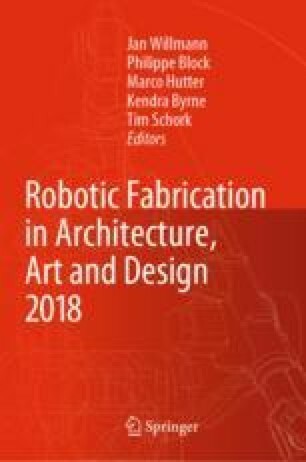 Robotic additive manufacturing methods have enabled the design and fabrication of novel forms and material systems that represent an important step forward for architectural fabrication. However, a common problem in additive manufacturing is to predict and incorporate the dynamic behavior of the material that is the result of the complex confluence of forces and material properties that occur during fabrication. While there have been some approaches towards verification systems, to date most robotic additive manufacturing processes lack verification to ensure deposition accuracy. Inaccuracies, or in some instances critical errors, can occur due to robot dynamics, material self-deflection, material coiling, or timing shifts in the case of multi-material prints. This paper addresses that gap by presenting an approach that uses vision-based sensing systems to assist robotic additive manufacturing processes. Using online image analysis techniques, occupancy maps can be created and updated during the fabrication process to document the actual position of the previously deposited material. This development is an intermediary step towards closed-loop robotic control systems that combine workspace sensing capabilities with decision-making algorithms to adjust toolpaths to correct for errors or inaccuracies if necessary. The occupancy grid map provides a complete representation of the print that can be analyzed to determine various key aspects, such as, print quality, extrusion diameter, adhesion between printed parts, and intersections within the meshes. This valuable quantitative information regarding system robustness can be used to influence the system’s future actions. This approach will help ensure consistent print quality and sound tectonics in robotic additive manufacturing processes, improving on current techniques and extending the possibilities of robotic fabrication in architecture.